Parents pass on a unique genetic makeup to their children. Little Johnny is a blonde-haired, blue-eyed boy with a one-of-a-kind thumbprint all because it is encoded in the DNA provided by his parents. But did you know that the quality of the DNA you pass on to your children can be impacted by stressful events in your life such as disease, malnutrition, and old age, ultimately influencing the way your children’s bodies respond to stress? That is what a new study looking at the impact of paternal stress on sperm genetics suggests. The HPA-axis is remarkably susceptible to environmental stressors and improper management of the HPA-axis has been linked to a number of psychiatric disorders including autism, schizophrenia, and depression. So can the stresses of life, occurring years prior to conception, really impact how your future kid’s HPA-axis handles stress? Rodgers and colleagues exposed both adolescent and adult male mice to prolonged stresses before breeding, such as leaving the lights on all night, creating funny odors, or introducing novel objects into their home. Researchers stressed male mice instead of female mice to limit the number of variables that could potentially influence their findings. Male mice only contribute their DNA to the pups, whereas in addition to changes in DNA female mice can also affect pups through life events during pregnancy or rearing. When evaluating the pups from stressed fathers, HPA-axis response was significantly reduced compared to pups of unstressed fathers. Decreased HPA-axis responsiveness is bad news for pups because it means they’re unable to respond appropriately to changes in their environment. Consistent with HPA-axis dysregulation, transcription, which is the first step of gene expression, was altered in brain regions responsible for regulating the body’s response to stress. But how exactly were these changes passed on? Did the father’s DNA change? Not exactly. Epigenetics is the study of changes in gene expression by modifying DNA without changing the actual nucleic acid sequence often by adding small molecules to the DNA nucleotides or altering the accessibility of the sequence. Several studies suggest that stress can lead to epigenetic modifications in sperm germ cells. Rodgers et al. found considerable changes in 9 sperm microRNA, molecules responsible for epigenetic alterations, within the group of fathers exposed to environmental stressors. Thus when the fathers were stressed over a prolonged period of time, it caused changes in the how the DNA they would eventually pass on to their offspring would be expressed. What’s the bottom line? Relax, eat well, and stay healthy to keep your sperm and subsequently all your future children happy and healthy! 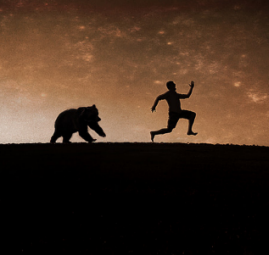 Oh, and stay away from bears.